An influential charismatic church is giving $1,000 to every household that lost their home in the Carr Fire, a move it says is a "God-sized step of faith." 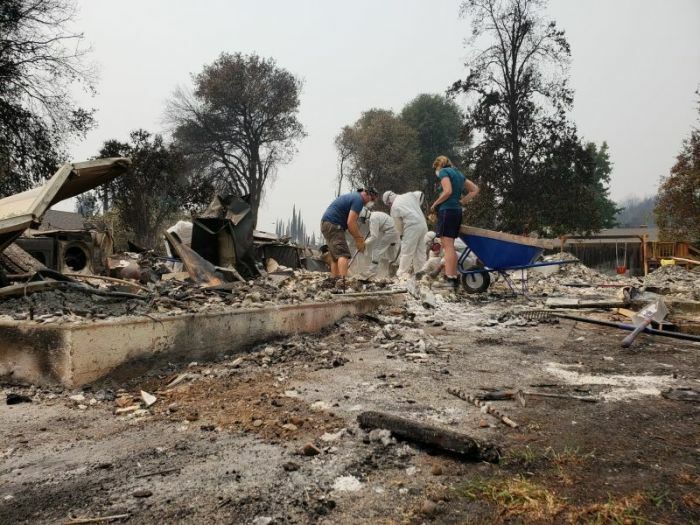 Bethel Church, which has several thousand members and is home to Bethel Music, announced on its website that it would be giving the money to those whose primary residence was destroyed in the fire that began raging near Redding, California, two weeks ago. "We are incredibly blessed as a church by people all around the world praying for us, donating and supporting our community here in Redding. The generosity of gifts coming towards us is both humbling and much needed. Christians around the world are coming together and supporting a cause that is bigger than any one individual alone can carry," the church explained. "When we first made the decision to give a financial gift for the people in our city who had lost their home, the numbers being reported were 150-200 homes. Within just three days, that number had climbed to over 1000 homes, and the amount we had expected to raise and give went from $200,000 to over $1,000,000 dollars." Bethel's original plan to give $200,000 "was a challenge, but doable in our own strength and resources," the church said. The only Redding and Shasta County residents who will qualify to receive the sum of money are those whose homes were their primary residence. Their houses must also be listed on the Housing Authority report as more than 50 percent destroyed. The money will not benefit those who lost their vacation homes, second homes, or rental properties. Only one gift of $1000 will be given per household. Days after the fire began, the church came under criticism on social media for not opening its doors for evacuees. Bethel maintained that it offered to be such a site but was told that it was situated too close to the fire zone and that it would not work to have people stay overnight given that there is only one road in and out of its premises. The Red Cross subsequently confirmed to local reporters this was indeed the case. The church is presently serving as a Salvation Army aid distribution site. Bethel Global Response has also deployed "Ash Out" teams, in which hundreds of volunteers help residents sift through the ashes of their homes to recover any valuables. "We cannot begin to describe the feeling of helping someone who lost their home find something that they thought was gone forever. This is part of what it means to live like Jesus-- to link hands together as we move forward," the church said on its Facebook page. Sources in Redding told CP Tuesday that the community is coming together wonderfully in the recovery efforts. From the Hearth Cafe, a popular eatery in town, has announced that it would be personal cooks for those families who lost their homes in the fire. Several announcements on the restaurant's Facebook page read: "If you've lost your home in the Carr fire, we are your kitchen. #weareyourkitchen." They will be serving these individuals free food for the month of August. Bill Johnson, senior leader of Bethel Church, said Sunday that they have been thrilled to see "incredible cooperation" in the city as Bethel volunteers, other churches as well as various organizations have stepped up to help. "What is happening really is a sign in the natural of a display of God's power being released across the city," he told the congregation. "This destruction was not caused by a loving Father. As I mentioned last week, you heard the voice of the Devourer for several days, you're about to hear the voice of the Restorer for months on end. God is going to restore at such a higher level, a greater place than anything we've seen happen." As of Tuesday afternoon, the Carr Fire is ranked the sixth most destructive fire in California's history, seven people have died because of it, and the blaze is 47 percent contained, reports say. The fire began on July 23 as a result of a vehicular failure near Whiskeytown National Park and has devoured almost 170,000 acres and 1,599 structures, according to CalFire, the state's fire agency.